A new patent application by technology giants seeks to use blockchain technology to fix a major problem the augmented reality (AR) gaming. During AR gaming, the gamer uses a mobile device which displays a real-time image of the game player’s location sometimes overlaid with an image of one or more game items. The gamer, therefore, interacts virtual as well as real objects. This brings in a need to ensure the safety of the gamer in real-world locations—the gamer needs to be guaranteed that the real-world locations within the game s marked safe. The multinational tech firm, which has made major inroads in blockchain development, originally filed a patent application with the United States Patent and Trademark Office (USPTO) that describes a system to solve this. The patent uses blockchain technology to introduce “trust” between real-world locations and location-based AR games. The document which was originally filed on April 30 last year, was published by the USPTO on last Thursday. As described in IBM’s patent filing, the system comprises a blockchain-enabled system that deters AR game players from intruding on undesirable locations like risky locations, cultural hotspots or private properties. The system uses a network of location sensors remotely connected to the mobile device and a locational database. According to the patent description, the sensors map out safe boundaries between AR objects and real-world physical locations. This information is updated in the database. A distributed ledger—also known as a blockchain—is used to prevent manipulation of the data recorded on the database. With the set-up, the gamer is prompted whenever his device enters into an undesirable location. This latest patent filing is one of the many blockchain related patents is the Big Blue has filed since the emerging technology gained attention in the tech sector. As Smartereum reported in September, intellectual property magazine iPR recognized IBM as having the highest number of blockchain patent applications in the United States. The firm boasted 89 filings at the time second globally to Chinese e-commerce giants Alibaba which had 90 blockchain-related patent applications. 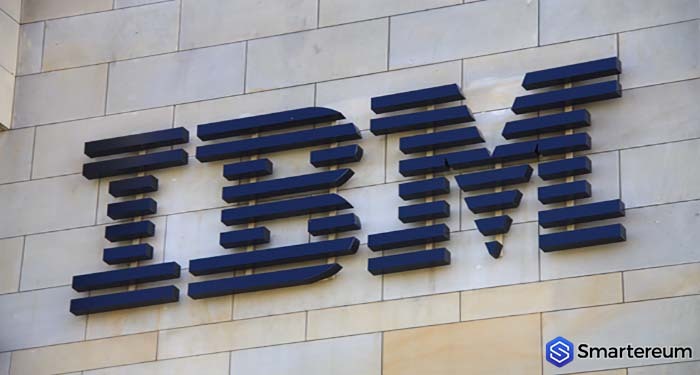 Beyond patent applications, IBM has established itself as one of the foremost developers of enterprise blockchain solutions which are currently being used or trialed by organizations. A notable solution is “TradeLens”, a technology that applies blockchain to the global shipping supply chain. The solution which was designed in partnership with shipping giant Maersk, was launched in August with about 94 organizations interested. IBM also has its hand in the food sector through its “IBM Food Trust” network which uses a distributed ledger to ensure the safety of food, and the financial sector after it unveiled a blockchain payment system powered by Stellar blockchain. More recently the tech giants designed a government-as-a-service blockchain network in Dubai—the first approved in the UAE. The enterprise platform, which is delivered through the IBM Cloud environment, will act as a foundation for UAE organizations who want to transition their blockchain development and testing into full production.